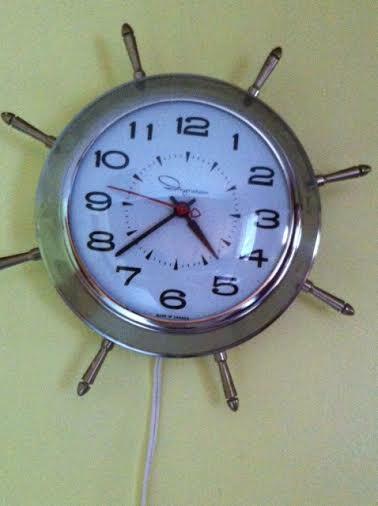 This old clock on the wall is a symbol of time in so many ways beyond the obvious. It is more than a time piece against the backdrop of an oft-painted kitchen wall. In the middle of the night if I had woken up I would peek into the room to check the time. Even though I owned a digital clock at a young age. Perhaps I trusted this one more since it never left its’ place on the wall. I started to think about where it could go in my own home. The trustworthy electronic powered gears would give off an audible hum that could be heard anywhere upstairs in the home. When there was no other noise around, you could always hear this clock rolling along with time. I remember seeing similar clocks in a few antique shops somewhere and occasionally running into them in different homes I have been in throughout my life. When I see them it takes me back to this place. This old familiar site on the old familiar wall. Where it was surrounded by the sites and smells of many meals, baking, or even just warmth from a tea kettle. As I walked through the rooms of this house for one final time I had intended to take this old clock with me. I figured I could find a home for it somewhere within the surroundings of my home office. Maybe continue to enjoy the familiar sounds I had become accustomed to for nearly twenty years. It is a sound I would occasionally think of on a few sleepless nights when I was far away from it. When I returned to the kitchen I reached for the wall with the intention of removing it before I left. I stopped and thought for a second or two about how empty the wall would seem if it was gone. How out of place it would look if I removed it. So I walked away from the room for the final time with the clock left in place. Whether it will remain there or not will be left to the new homeowner’s choice. From my perspective, it belongs to this house and on this wall. This is how I will remember it, regardless of where time takes it next. June 17, 2014 Update. Hours after this was posted, my brother called me to say that after he read this, he decided he wanted the old clock. So it’s going to stay with the family after all. Posted in Notes from the Frogpond.Tagged antique, clock, clocks, electronic, gears, home, house, time, time piece. Previous Post Peace in a Place, MacPhersons Mills.